(c) the towing by a powered sailplane of an aircraft to which this Order or Civil Aviation Order 95.8 (CAO 95.8) applies. The Gliding Federation of Australia (GFA), operating under a Deed of Agreement with the Civil Aviation Safety Authority (CASA), is the aviation administration organisation applicable to the Gliding in Australia is subject to the Civil Aviation Act 1988, Civil Aviation Regulations 1988, Civil Aviation Safety Regulations 1998 and other relevant Legislation as amended from time to time. Certain exemptions from the provisions of the Civil Aviation Regulations 1988 have been granted to members of the GFA by way of Civil Aviation Orders 95.4 and 95.4.1. Where exemptions exist, the practices adopted by GFA are outlined in these Operational Regulations approved by CASA. For all other operational procedures refer to the GFA Manual of Standard Procedures (MOSP) Part 2 (Operations) approved by the GFA Board. In these Regulations the term 'sailplane' shall include powered sailplanes and power assisted sailplanes. These Regulations apply to sailplanes on that portion of the Register of Australian Aircraft kept by GFA, and to foreign sailplanes operated in Australia by, or under the auspices of, the GFA (or any GFA member). 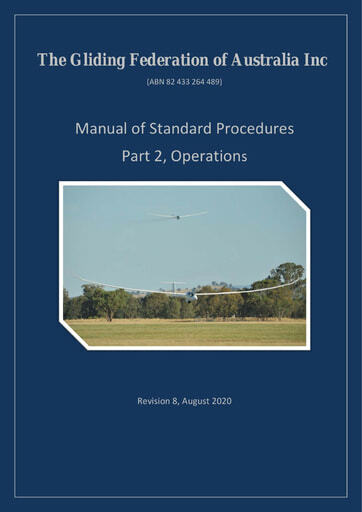 This Manual of Standard Procedures outlines the basic rules and recommendations by which gliding operations are conducted in Australia. Organisations affiliated with the GFA and individuals becoming members must agree to accept and operate within these rules. In this document the term 'sailplane' shall include powered sailplanes and power assisted sailplanes. Where the requirements of these Standard Procedures differ from those contained in other Legislative documents or the GFA Operational Regulations, the other Legislative documents and GFA Operational Regulations and shall take precedence. Certification, maintenance, modification and repair of sailplanes, powered sailplanes and power-assisted sailplanes shall be carried out in accordance with MOSP Part 3 (Airworthiness).